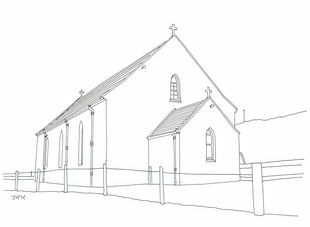 The present-day St. Brendan’s Church at Craigston, the ‘mother church of the island’ was built in 1857 on the site of a much older church which dates back to 1805 with origins going back to earlieast times as this is said to be on the site where St Brendan the Navigator made his settlement. The church is charming, a very suitable place to go for quiet prayer. It is a simple harled oblong three-bay church with pointed windows and a gabled porch. Restored 1858. Two etchings (scraperboard white on black) of St Brendan and St Barr, by Fr Calum MacNeill, former priest of the diocese.